Moon Hunter Keep! A name spoken by the Silver Dawn werewolf hunters of Reaper's March only in whispers—that is, when there still were Silver Dawn werewolf hunters in Reaper's March. Moon Hunter Keep is a group dungeon set in a Colovian fort overrun by werewolves. It can be found north of Senalana, on the Cyrodiil side of the Strid River. It is the headquarters for the Order of the Silver Dawn, a group of werewolf hunters but has recently been destroyed by the Werewolf Lord Vykosa, who has begun amassing a massive army of were-beasts. Along with the March of Sacrifices, it is part of the Wolfhunter DLC. The following item sets will drop in Moon Hunter Keep: Moon Hunter, Savage Werewolf, Jailer's Tenacity, and Vykosa. Moon Hunter Keep Objective: Investigate Moon Hunter Keep. Following lorebooks can be found inside the dungeon: A Cure for Lycanthropy, By Order of the Silver Dawn, Letter to Mylenne, Log No. 321: Unexpected Results, Rolea's Journal, The Hedge Maze, and The Hungry Cat's Curse. Moon Hunter Keep Challenger 50 Complete the listed achievements for Veteran Moon Hunter Keep. Moon Hunter Keep Conqueror 10 Defeat Jailer Melitus, Hedge Maze Guardian, Mylenne Moon-Caller, Archivist Ernarde, and Vykosa the Ascendant in Veteran Moon Hunter Keep. The Alpha Predator 50 Defeat Vykosa the Ascendant after reading the Scroll of Glorious Battle in Veteran Moon Hunter Keep. ​ Running With the Pack 50 Defeat all encounters in addition to Jailer Melitus, Hedge Maze Guardian, Mylenne Moon-Caller, Archivist Ernarde, and Vykosa the Ascendant in Veteran Moon Hunter Keep in under 30 minutes. Timer starts when players engage the first group of Moon Hunter enemies. Moon Hunter Keep Vanquisher 10 Defeat Jailer Melitus, Hedge Maze Guardian, Mylenne Moon-Caller, Archivist Ernarde, and Vykosa the Ascendant in Moon Hunter Keep. 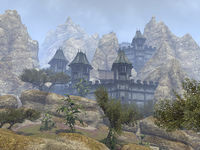 Parts of the keep can be seen from behind the mountains at the exterior entrance in Reaper's March.